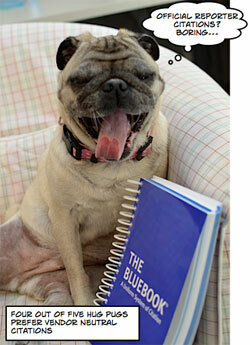 Friends, lawyers–did you know that the Bluebook is available online? I confess, I did not until a couple weeks ago. I needed to research citation formats, but my Bluebook was sadly out of date (think law school). I didn’t want to wait for the copy to arrive by mail, so I bought an online subscription. I was kind of skeptical. After all, half the benefit of the book is all the little tabs and notes that you’ve added over the years. I was impressed by the service though, so I thought I would share.